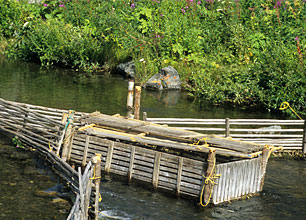 Commercial salmon fisheries in Alaska target summer and fall chum. The commercial Chinook fishery fell by about 50% in 1998 and has not recovered since. Catches since 2008 have been very small. The Canadian commercial fishery is centered in the Dawson area, with a smaller fishery in the Minto area. Fall chum are targeted. Catches have been low since the closure of the Han Fisheries plant and associated roe market in 1997. The Chinook fishery was reduced to less than 50% in 1997 and has either been closed or has had very low captures since.